Fitscape is a partner brand to in:spa and offers exceptional holidays that focus specifically on fitness. Fitscape fitness holidays are inspiring, healthy, and fun; designed by our team of experts to ensure you return home much, much fitter and looking and feeling fantastic. That’s probably why The Sunday Times recently said: “I cannot recommend fitscape highly enough.” fitscape fitness holidays are suitable for men and women of all ages and all fitness levels and are available throughout the year. fitscape is owned and operated by The Healthy Holiday Company, which also owns and operates in:spa retreats. 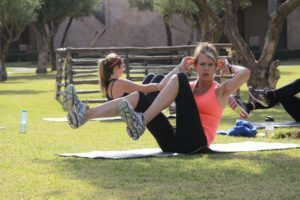 The fitscape team of highly regarded and experienced personal trainers have devised a series of challenging and entertaining weeks, packed full of outdoor activities to deliver a significant increase in your fitness levels and leave you feeling energised, recharged and motivated. All our guests tell us they notice improvements in cardio fitness, stamina and strength – plus the additional benefit, if that’s what you want, of weight-loss. fitscape hosts 7 night trips to a selection of hand-picked destinations: the spectacular Italian Dolomite Mountains at our 5 star hotel (offering both winter fitness and skiing and summer mountain adventures); and a charming private residence in Andalusia, Spain. Our smart, stylish venues combine stunning natural scenery with beautiful, comfortable accommodation. All daily training sessions, classes and activities are optional and you can therefore design your personal daily programme, with the guidance of our trainers. There’s a comprehensive mix of hiking, circuit training, boxercise, jogging / running, cycling / mountain biking, stretching classes, and other optional sports and recreations, such as swimming, massage treatments and golf. Three personal trainers look after each group (there are approximately 20 guests per trip), so everyone can work at their own level and receive a high degree of personal care and attention from our fitness team. The food is healthy, delicious and nutritious – and plentiful, given the amount of exercise everyone takes. Evenings are relaxed, sociable and fun at the end of a rewarding day’s work. Every fitscape fitness holiday is unique and takes into account the varying terrain and opportunities at each of our destinations. The daily schedule is packed full of different options so that, with expert advice and guidance, you can design your own personal schedule for optimum results. You tell us what you want to get out of your holiday – anything from a gentle, motivating kick-start through to a serious competitive challenge.